Minna Press' publishing mission is to provide intellectual and cultural enrichment as well as produce books that are ecologically sustainable. We choose print-on-demand and digital technology because we care about the fate of our environment. Every year billions of trees are cut down for bulk printing, not to mention the energy required to warehouse these books. It makes economic sense to print books when you need them. 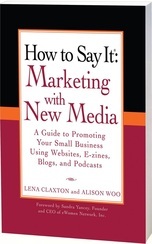 Lena Rose (Claxton) is CEO of Minna Press and co-author of the book, "How to Say It: Marketing with New Media, A Guide to Promoting Your Small Business Using Websites, E-zines, Blogs & Podcasts," published by Penguin-Prentice Hall Press. She is also author of a historical fiction and a short story collection. Previously, she was a partner with New Media Mavens, LLC, a new media marketing consulting firm based in New York and Charlotte, North Carolina. Prior to forming the partnership, she was marketing manager at Baker & Taylor, one of the largest book distribution companies in the United States. A graduate of Rutgers University and the University of Phoenix, she received her bachelors degrees in English Literature & Journalism/Media Studies as well as a masters degree in adult education and e-learning. Lena has taught marketing and entrepreneurial studies at Central Piedmont College's Adult Education Division and has conducted many workshops for small businesses throughout the U.S. on branding, social media marketing, website 101, e-mail marketing and more. Lena has published many articles in various venues, notably, The Entrepreneurial Woman Magazine and various Internet portals. She resides in both Jamaica and Charlotte, North Carolina. - Entrepreneur Magazine (2008) says: "From copywriting basics to search engine optimization, this how-to offers specific tips on using the latest online channels." "The essential resource for building a global community of customers" How to Say It®: Marketing with New Media provides business owners with the tools they need to effectively market their company to today’s ever-evolving online community. Packed with power words, content templates, practical steps for getting the word out, and the essentials of speaking to the right audience, this book is the key to building a community of loyal customers online. It also offers tips for generating website copy, articles, podcast scripts, and blog posts months in advance, so any small business owner can start an online marketing campaign regardless of limited schedules and budgets.